John Wiley & Sons, ISBN: 0471414646, 256 pages. Mark Victor Hansen, Robin Leech, Dr. Nathaniel Branden, other experts, media, celebrities and more than 6500 corporations. Move over Dr. Norman Vincent Peale, Optimal Thinking has become the successor to positive thinking. Hailed by academia and the media as “the essential step above positive thinking,” Optimal Thinking empowers us to be our best in any circumstance. It stops us from settling for second best! 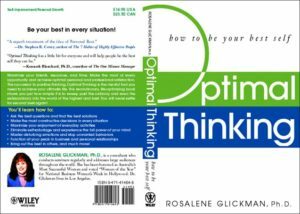 Created by Dr. Rosalene Glickman, repeatedly honored by the media as “Australia’s Most Successful Woman,” Optimal Thinking programs throughout the world are replacing the “think positive!” motto which has been with us for decades. An evergreen, the book ranked among Amazon.com’s top 10 books in the Applied Psychology, Leadership, Success, Personal Transformation, and Career Guides categories for six years. Optimal Thinking is the language of our best self. It empowers our highest self to take charge. We ask the best questions, obtain the best solutions, and make the most constructive decisions in every situation — and eliminate “if only..” from our lives! In today’s competitive world, many positive thinkers still think in mediocre terms and settle for second best. Whenever you think suboptimally, it costs you time, energy, joy and money. You function at your peak when you think in optimal terms. Optimal Thinking — not positive thinking — is the mental basis of peak performance. What’s most exciting about Optimal Thinking is that everybody can use it. It doesn’t matter what stage of life you are in, or in what circumstance you find yourself — you can use Optimal Thinking to instantly make the most of your life. This revolutionary book truly empowers you to experience the full power of your mind. You will eliminate self-sabotage, master disturbing emotions, minimize unwanted behaviors, bring out the best in others, and much more. Take the ultimate quantum leap — enjoy the style of thinking that gives you the best chance of having everything you want. 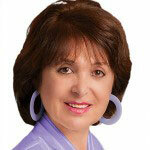 Author, Rosalene Glickman, Ph.D. received the I.R.W.I.N. Award (Industry Recognition for Writers In The News) in the Best Non-Fiction category for Optimal Thinking by the Book Publicists of Southern California. Do you recognize these Optimal Thinkers? Book Take the quantum leap! What Does “Optimal” Mean To You? What does “Optimal” really mean? Self-esteem: What’s it all about? How do you value and rate yourself now? How do you relate to your feelings? Dr. Stephen R. Covey, Author, The 7 Habits of Highly Effective People. Kenneth Blanchard Ph.D., Author, The One Minute Manager. Dr. Gregory H. Tefft, Triple Crown Mr. America, Olympics Sports Medicine Staff. Mark Victor Hansen, #1 New York Times best selling series, Chicken Soup for the Soul®. Nathaniel Branden, Ph.D., Author, Six Pillars of Self-Esteem. Brian Tracy, Author, Psychology of Achievement. Robert Brooks, Ph.D., Faculty, Harvard Medical School and co-author, The Power of Resilience. Gordon Patzer, Ph.D., Dean, College of Business and Public Administration, Roosevelt University, Chicago.